The image below depicts an example of maxillofacial prosthetics. Ocular prosthesis replaces a missing right eye. Cantor and Curtis classified mandibular defects into 6 different categories based on extent of the defect and the method of restoration in edentulous patients. Surgical reconstruction using a bone graft is the best approach that a surgeon can take to correct defects of the mandible. The bone graft restores continuity to the mandible and provides a prosthesis-bearing area. However, surgical reconstruction may be contraindicated in patients receiving radiation therapy or in individuals with residual tumors. If mandibular resection involves the lower border of the mandible, the remaining segments deviate toward the defect side, backward, and upward. Using intermaxillary fixation for 5-7 weeks following the resection can reduce the deviation. The placement of a resection guidance appliance can also help minimize the deviation. These appliances are temporary and are removed once acceptable occlusal relationship and proper proprioception are attained. Surgical reconstruction of mandibular defects through myocutaneous, osteomyocutaneous, or microsurgical techniques is the treatment of choice for establishment of mandibular continuity. However, use of bone graft alone seldom provides an optimal base for removable prostheses. Optimal treatment involves placement of endosseous implants in the bone graft, which help to anchor removable or fixed prostheses. The implants also minimize bone resorption and add to patient comfort. When surgical reconstruction is contraindicated because of the presence of residual tumors or the patient's poor physical condition, perform prosthetic rehabilitation of the partially edentulous mandible with a mandibular guidance prosthesis. Optimally, design of such a prosthesis incorporates a rigid major connector and allows the device to obtain major support from adjacent soft tissue and teeth. In edentulous mandibulectomy, extending the denture into the soft tissue area on the resected side beyond the bony resection forms an outrigger that helps make the denture stable. On insertion of this denture, an occlusal ramp may be added to the palatal side of the maxillary teeth on the nonresected side. This ramp helps guide the mandible to the desired occlusion during closure. In both edentulous and dentulous patients, attempt to close the bite as far as possible in order to facilitate insertion of a food bolus and to minimize stress transmitted to the remaining ridges. Tongue (glossal) defects can be partial or total. Factors influencing prosthetic prognosis of restoring the tongue include the presence or absence of teeth and the type of procedure that is combined with the glossectomy (eg, mandibulectomy, palatectomy, radiation therapy). Patients with partial glossectomy (ie, < 50% of tongue removed) suffer minimal functional impairment and require no prosthetic intervention. Removal of more than 50% of the tongue requires construction of a palatal or lingual augmentation prosthesis. In edentulous patients, tongue prosthesis can be retained to either a mandibular or maxillary denture (see the image below). 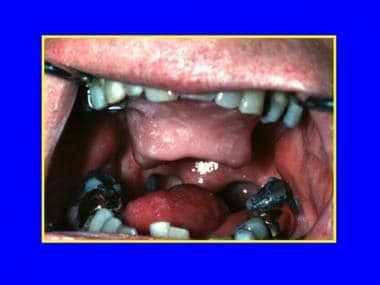 Common problems associated with tongue prosthesis include lack of salivary control and loss of ability to maneuver food from the buccal vestibule. Therefore, it is best to fabricate 2 prosthetic tongues, 1 for swallowing and 1 for speech. A partial glossectomy with an artificial tongue attached to the maxillary arch is depicted. A typical prosthetic tongue for speech is flat with wide anterior elevation, which aids in articulation of anterior lingual alveolar sounds (eg, /t/, /d/). The typical prosthetic tongue also has a posterior elevation, which aids in production of posterior lingual alveolar sounds (eg, /k/, /g/) and helps shape the oral cavity for improved vowel productions (see the image below). 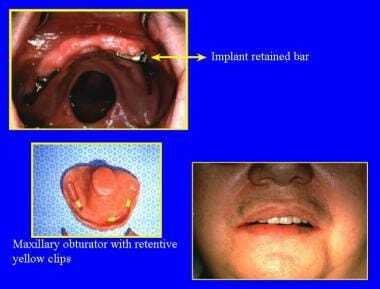 Total glossectomy with an artificial tongue for speech is shown. Note the anterior and posterior elevations. The tongue prosthesis for swallowing is made with a trough in its posterior slope to guide the food bolus into the oropharynx. A speech pathologist and, when necessary, a nutritionist should monitor all patients who have a glossectomy. Hard and soft palate defects are best treated with obturator or speech aid regardless of the presence or absence of teeth. Saving as much of the maxillae as possible without compromising tumor resection is important. Retention of the premaxillae and/or key teeth (eg, cuspids, first molars) helps enhance prosthesis stability and support. Using a split-thickness skin graft to line the cheek flap enhances prosthesis tolerance. In addition, the mucodermal junction forms a lateral scar band, which helps retain and stabilize the prosthesis (see the image below). 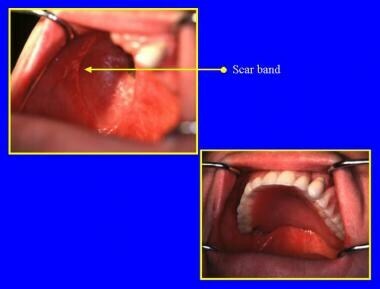 Scar band formed by the muco-dermal junction helps retain the maxillary obturator. In prosthetic rehabilitation of maxillectomy, the surgical obturator is placed immediately after maxillae resection. A wrought wire clasp, sutures, or screws attached to the remaining palatal bone can retain the obturator (see the image below). The obturator helps maintain surgical packing, helps the patient speak and swallow, and adds to the patient's comfort and psychological stability. A defect in the medial portion of the hard palate is pictured. Two bars screwed to 4 implants retain the obturator. Prior to resection, the surgical obturator is fabricated from the impression made of the maxillary arch. This cast is modified according to the planned surgery. From the modified cast, the surgical obturator is waxed and processed in clear acrylic resin and inserted immediately after surgery. After 5-7 days, the surgical obturator and packing are removed, the defect area is cleaned with mineral oil, and the surgical obturator is adjusted and relined with tissue-conditioning material. The patient then returns weekly for adjustment and change of relining material. Finally, the relined surgical obturator is duplicated in heat-cured, clear, acrylic resin. This process results in a cleaner interim obturator. Maxillary prosthesis retained by implants positioned in the remaining maxillae as well as the Zygomatic bone. Patients, who undergo radiation therapy to the head and neck region, will experience several effects of radiation to the oral cavity. These effects include mucositis, loss of taste, xerostomia and trismus. Patients who have ill fitting dentures are instructed not to wear their dentures during the course of radiation therapy. Fabrication of new denture should be delayed until the oral soft tissue has adequately healed. Healing could take 3-12 month before the new dentures could be fabricated. Soft tissues should be manipulated very gently when developing the denture border extension. In addition, interocclusal record should be done at a decreased vertical dimension. This decreased vertical dimension allows less transfer of load to the supporting tissues as well as, it will help in compensating for decreased opening ability that is due to trismus. The use of dental implants has been studied by several authors. Some authors recommended the use if hyperbaric oxygen treatment (HBO) prior to implant placement. Others don’t recommend the use of HBO. Literatures seem to find equal implant success and failure rates regardless of the use of HBO. Overall, implants in radiated patients experienced a very high success rate that is slightly less than the success achieved in patients that had no radiation. The benefits gained by the use of implants are great. This makes it highly recommended to use dental implants in radiated patients whenever it is possible. Prosthetic treatment of soft palate defects varies based on the extent and site of the defect. 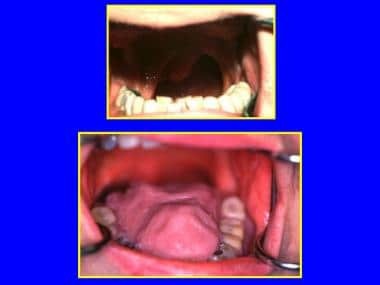 The goal of treatment is to attain velopharyngeal closure during function, which allows normal speaking and swallowing and keeps the patient relatively comfortable. In edentulous patients, after the conventional maxillary denture is fabricated, a wire is attached to the palatal end of the denture and extended to the defect area. An impression of the defect area is attained and duplicated in clear, cold, cured acrylic, thus, forming the speech bulb. The speech bulb can be attached to a removable partial denture framework in the same manner for dentulous patients (see the image below). Following fabrication, the prosthesis is positioned in the mouth and checked for overextension using pressure-indicating paste and tissue-conditioning material. Evaluate the patient for comfort, breathing, and swallowing ability. Water leakage should not occur during swallowing of fluids. Both plosive sounds (eg, /p/, /t/) and nasal sounds (eg, /m/, /n/, /ng/) should be produced easily. 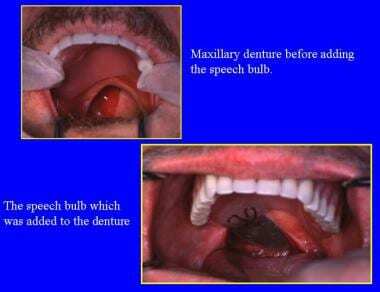 Soft palate defect and a speech bulb that is attached to the maxillary denture are depicted. 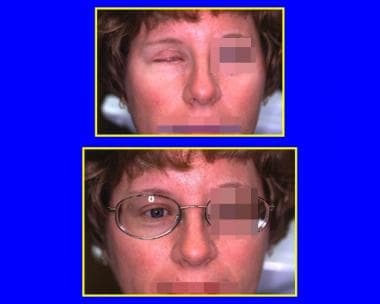 Restoration of facial defects can be accomplished either surgically, prosthetically, or by using a combination of both methods. The choice of method depends on many factors (eg, size and location of the defect, age of patient). Surgical reconstruction is indicated when the defect is small in size, involves mobile structures (eg, eyelid, lip), or occupies the cranial vault, especially if the margins of the defect are clear of cancer. It is important to use prosthetic materials with certain properties in order to achieve clinical success and patient acceptance. These properties include color stability, ease of fabrication, dimensional stability, and edge strength. Flexibility, low thermal conductivity, biocompatibility, and surface texture are also important. Silicones are the most widely used materials for facial restorations in the United States. The type most commonly used, RTV Silicone MDX-4-4210, has surface texture and hardness within the range of human skin. 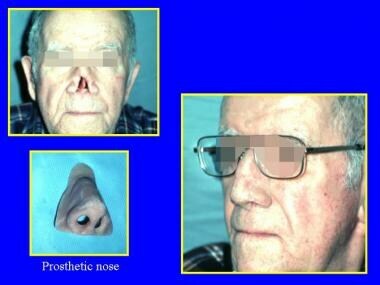 An artificial nose is attached with medical-grade adhesive. 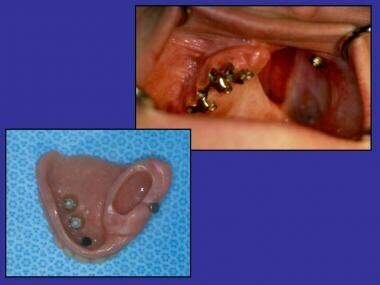 Endosseous implants placed in surrounding facial bone to help anchor different facial prostheses have been widely used. Implants in the mastoid process retain auricular prostheses. Orbital rim implants may anchor orbital prostheses, and implants placed in malar bone and/or the anterior nasal spine can be used to secure nasal prostheses. Thiele OC, Brom J, Dunsche A, et al. The current state of facial prosthetics – A multicenter analysis. J Craniomaxillofac Surg. 2015 Sep. 43 (7):1038-41. [Medline]. Aramany MA, Downs JA, Beery QC, et al. Prosthodontic rehabilitation for glossectomy patients. J Prosthet Dent. 1982 Jul. 48(1):78-81. [Medline]. Borlase G. Use of obturators in rehabilitation of maxillectomy defects. Ann R Australas Coll Dent Surg. 2000. 15:75-9. [Medline]. Fukuda M, Takahashi T, Nagai H. Implant-supported edentulous maxillary obturators with milled bar attachments after maxillectomy. J Oral Maxillofac Surg. 2004. 62(7):799-805. [Medline]. Goyal MK, Goyal S, Dhanasekar B. Modern trends in modeling of extra-oral defects. Indian J Dent Res. 2014 Jan-Feb. 25 (1):128-32. [Medline]. [Full Text]. Goyal MK, Goyal S. Prosthetic rehabilitation of large nasal septal defect with an intranasal stent: a clinical report. Indian J Dent Res. 2011 Sep-Oct. 22(5):719-22. [Medline]. Goveas R, Puttipisitchet O, Shrestha B, Thaworanunta S, Srithavaj ML. Silicone nasal prosthesis retained by an intranasal stent: a clinical report. J Prosthet Dent. 2012 Aug. 108(2):129-32. [Medline]. Sumita YI, Otomaru T, Taniguchi H. Effects of a denture adhesive in edentulous patients after maxillectomy. Gerodontology. 2012 Jun. 29(2):e645-9. [Medline]. Cheung LK, Leung AC. Dental implants in reconstructed jaws: implant longevity and peri-implant tissue outcomes. J Oral Maxillofac Surg. 2003. 61(11):1263-74. [Medline]. McCord JF, Michelinakis G. Systematic review of the evidence supporting intra-oral maxillofacial prosthodontic care. Eur J Prosthodont Restor Dent. 2004. 12(3):129-35. [Medline]. Schmidt BL, Pogrel MA, Young CW. Reconstruction of extensive maxillary defects using zygomaticus implants. J Oral Maxillofac Surg. 2004. 62(9 Suppl 2):82-89. [Medline]. A bar with magnets is screwed to mastoid implants in order to retain a right artificial ear. A guiding flange prosthesis maintains the remaining mandible in occlusion. Nasotracheal intubation blind and unblinded. Video courtesy of Therese Canares, MD, and Jonathan Valente, MD, Rhode Island Hospital, Brown University.